While my summer reading list was often full of nonfiction, despairing memoirs, and dystopian nightmare scenarios, sometimes I just need to escape into a quick summer beach read. In this case, my interlude came in the form of “mommy lit” – stories about mothers of young kids; sleep-deprived mothers who are running on coffee and dinosaur-shaped chicken nuggets; moms who love their little ones dearly, but occasionally fantasize about long-ago child-free spa weekends – you know, someone I can relate to. If you aren’t familiar with Bumni Laditan, she’s the creator of The Honest Toddler, a blog-turned-book written in that voice we all secretly think belongs to our own children. 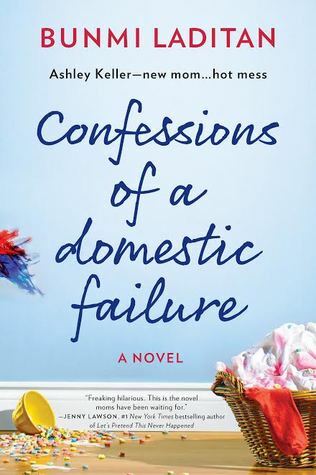 Confessions of a Domestic Failure is Laditan’s first novel, and it centers around Ashley Keller, a newly minted stay-at-home-mom (by way of corporate layoff). Ashley is smart and resourceful – she was an ace at her marketing job before the layoff, and she can fashion an emergency diaper out of items in the backseat of her car – but she is also failing spectacularly at creating the blissful family life she thinks is expected of her. Her house is a mess, she hasn’t lost the baby weight, her daughter rarely makes it out of pajamas (so much for all those cute baby clothes! ), and she is struggling to be supportive of her husband’s decision to quit his own corporate job to start a new company. Ashley is determined to be a Pinterest-perfect mother with an Instagram-worthy home and a huge circle of supportive mommy gal pals… if she can ever peel off her Cheerio-crusted yoga pants and find the energy to shower. Laditan perfectly and hilariously captures the isolation and exhaustion of new motherhood and the pressures social media creates to project perfection. Ashley is offered a chance to compete in a “Motherhood Better” competition held by superstar mommy-blogger Emily Walker. She stumbles through each challenge, and madcap antics ensue – from accidentally mooning the other competitors during a live video conference, to lying her way into a breastfeeding support group (though her daughter takes formula) while trying to make mom-friends, to nearly setting her house ablaze while “crafting”. But somehow she makes it to the finals and gets to meet her idol Emily. Will she win the contest and push her jogging stroller into the sunset… or will the pressure of domestic perfection cause her to crash and burn?